Whether you like to hunt and need a freezer big enough to handle the fresh game you bring home after your hunting trip, or if you buy products in bulk to provide for a big family, the Frigidaire Chest Freezer has more than enough space to meet your storage needs. While space matters in choosing a freezer, there are a few more aspects of choosing the right chest freezer that can help sway your decision either way, such as consistency of temperature, durability, warranty, ease of use, and much more. In this article, see how the Frigidaire Chest Freezer stacks up against its competitors in the following review. What Is the Frigidaire Chest Freezer? 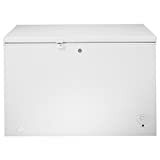 The Frigidaire Chest Freezer is a 15.6 cubic foot chest freezer. It is simple and built to withstand blows to its exterior. Its textured white exterior makes it fit in wherever you need it to. Its size is impressive and will probably be more than enough freezer space for everyday use - even for a bulk shopper or hunter. The 15.6 cubic foot Frigidaire Chest Freezer does just what any chest freezer is supposed to do - keep things cold. The bottom of the freezer stays well below 0 degrees Fahrenheit, but the temperature can be inconsistent near the top. Like most chest freezers, Frigidaire Chest Freezer also has a lock on the door to prevent it from being opened without authorization. This is great to keep it kid-proof and burglar-proof and keeps it from being left open by accident and letting in heat. While the Frigidaire Chest Feature isn't equipped with a whole lot of extra features, this freezer is clearly doing fine without them. The job of a freezer is to keep food sufficiently cold to prevent it from going bad or developing freezer burn. The Frigidaire Chest Freezer does a great job of keeping food fresh and cold in almost every spot that was tested. Overall, this freezer stayed mostly cold, but it is worth noting that some spots in this freezer were found to be warmer than 0 degrees Fahrenheit upon performing a temperature check. If you need food stored for an extended period, we recommend keeping it near the bottom to prevent it from becoming too warm. You can store the food you want to access easily at the top without much worry of spoilage. Chest freezers are meant to be simple and focus more on storage than extra features. The design of the Frigidaire Chest Freezer proves this to be true. There is little functionality for organization other than a single sliding basket near the top of the freezer. As far as the outside of it goes, the freezer's exterior is a textured white, which is surprisingly difficult to get marked up with dirt, but if it somehow manages to be scuffed, the exterior is also very easy to clean. The interior is also easy to clean in the event of accidental spills. Frigidaire offers a standard one-year warranty on all of their products, including the Frigidaire Chest Freezer. Frigidaire's customer service really makes the warranty worth it. When you call them while under warranty, they will try to help you diagnose the problem with your appliance over the phone. When they come by your home, repairs tend to happen extremely quickly due to Frigidaire's service trucks coming equipped with over 400 different parts to fix a variety of appliance maladies on the first visit. Their skilled workers are also more than willing to give you advice and tips on how to get the most out of your appliance. The Midea WHS-109FW1 is a small freezer, only measuring about 3 cubic feet. This freezer is perfect for small spaces or if you don't need to store much food. It comes equipped with an ice maker, adjustable legs to adapt to any surface, and a reversible door hinge. This tiny 34-inch-tall freezer is very simple to use. With tons of freezer space for everyday use, this freezer makes it easy to store and retrieve your food. If you feel like you have to play Tetris every time you go to put your groceries away, this customizable freezer door will make your life so much easier and make coming home from the store a breeze. This freezer is perfect for a nursery, a basement, or a small apartment. This small little freezer packs a punch. Due to its small size, it easily stays consistently cold throughout the 3 cubic foot freezer space. As soon as you set it up and plug it in, it gets to work quickly, and you can store food in it almost immediately without having to worry about it spoiling. This freezer comes in three different colors, white, black, and stainless steel. The color options allow you to choose what color would look the best in the room of your choosing. With a deceptively large amount of freezer space, and tons of customization options to use the small freezer to your advantage, this freezer is well designed to fit into small spaces without sacrificing performance or ease-of-use. Midea offers the typical one-year warranty for appliances. Unfortunately, their customer service hasn't been quite up to par, and they tend to ignore customer complaints. The Whynter CUF-110B freezer has 1.1 cubic feet of storage. As you can imagine, this freezer is very small in stature. At about 19.5 inches tall and just under 18 inches wide, this freezer will fit nearly anywhere you might need a small freezer. Many have found this freezer to be useful in campers and basements. At just over 40 pounds, the Whynter CUF-110B freezer is ideal for when you need to move frozen food around. Because it is pretty lightweight, it's possible for most adults to be able to lift it on their own - even with food in it. This freezer is perfect for camping trips and transporting frozen goods for selling or otherwise. The reversible door makes it easier than ever to get food in and out. This compact freezer freezes well and will do it quickly. However, it does have a manual defrost, which can be a bit of a hassle. When limited on space, everything becomes a game of Tetris in the freezer. However, this freezer has no customization options whatsoever, which only adds to the difficulty. It's hard to be too mad about the lack of customization and organization options since the freezer is so small as it is. Whynter offers only the standard one-year warranty, with a list of limitations. The warranty does not cover damage caused by natural disasters or accidents, power surges, or any other type of damage incurred that has nothing to do with a defective part. The warranty also only covers the return cost for the product for the first two months after purchase. After that, the price of return shipping will be your responsibility until the warranty's expiration date. Whynter also claims that they are not responsible for shipper mishandling or poor packaging. The GE FCM11PHWW is a 10.6 cubic foot freezer with a ton of space for your food storage needs. This chest freezer is smaller than the Frigidaire Chest Freezer but is still excellent for hunters and bulk shoppers. At 33.5 inches tall when the lid closed and just under 51 inches wide, this freezer is on the bigger side, but it can hold up to 11 bags of groceries, so we can't complain about its bulk too much. To protect your food items and any kids that might be playing around it, it comes with a lock and a key for that extra layer of protection and peace of mind. The temperature control ranges from -10 to 15 degrees Fahrenheit. The GE FCM11PHWW Chest Freezer is easy to use. With the controls readily accessible in the front of the freezer and the bright light that lets you easily see inside of the freezer in low light, this freezer is easy for just about anyone to use. This chest freezer is a great, energy efficient performer. It is specially designed so that it will keep your frozen good frozen for days in the case of a power outage. It has a manual defrost instead of an automatic defrost, but the instruction manual comes with a detailed explanation of how to do this when needed. The design quality of this chest freezer is excellent. With three sliding baskets for extra food storage, to the easily accessible controls, it is easy for anyone to use. One thing we have noted when reviewing the product is that the lock-and-key feature is not very sturdy. While this chest freezer is kid-proof, it's not exactly burglar proof, and we would recommend keeping it in a safe and secure area. GE's standard one-year warranty covers damage in a limited amount of scenarios. It does not cover Acts of God, such as natural disasters, it does not cover accidents, and it does not cover any damage caused by improper delivery or installation practices. It only covers damage caused by defective material or parts within one year after the purchase is made. Luckily, unlike with some other one-year warranty packages, you won't need to pay for return shipping if you need to replace your chest freezer. We give the Frigidaire Chest freezer a solid 4/5 stars. 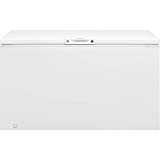 It is one of the biggest and most spacious chest freezers on the market today, it's easy to use, and Frigidaire offers a great warranty and great customer service. However, we advise using caution when deciding whether or not to purchase a Frigidaire Chest Freezer due to its tendency not to be able to freeze evenly. With its large size, this may be an inevitable problem, but depending on your food storage needs, the uneven freezing might mean that the Frigidaire Chest Freezer is not right for you.